India is a multi-lingual, multi-script country. 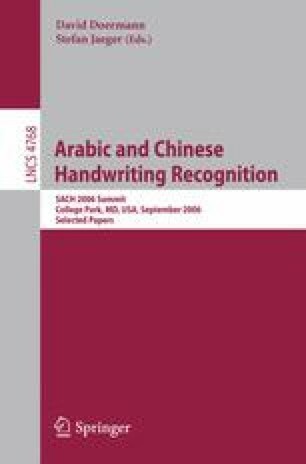 Considerably less work has been done towards handwritten character recognition of Indian languages than for other languages. In this paper we propose a quadratic classifier based scheme for the recognition of off-line handwritten characters of three popular south Indian scripts: Kannada, Telugu, and Tamil. The features used here are mainly obtained from the directional information. For feature computation, the bounding box of a character is segmented into blocks, and the directional features are computed in each block. These blocks are then down-sampled by a Gaussian filter, and the features obtained from the down-sampled blocks are fed to a modified quadratic classifier for recognition. Here, we used two sets of features. We used 64-dimensional features for high speed recognition and 400-dimensional features for high accuracy recognition. A five-fold cross validation technique was used for result computation, and we obtained 90.34%, 90.90%, and 96.73% accuracy rates from Kannada, Telugu, and Tamil characters, respectively, from 400 dimensional features.